Okay, here is another Polka Dotted FREE printable. 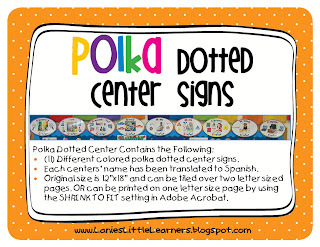 Polka Dotted Center signs are a set of (11) different center signs to use in your classroom for personal use only! 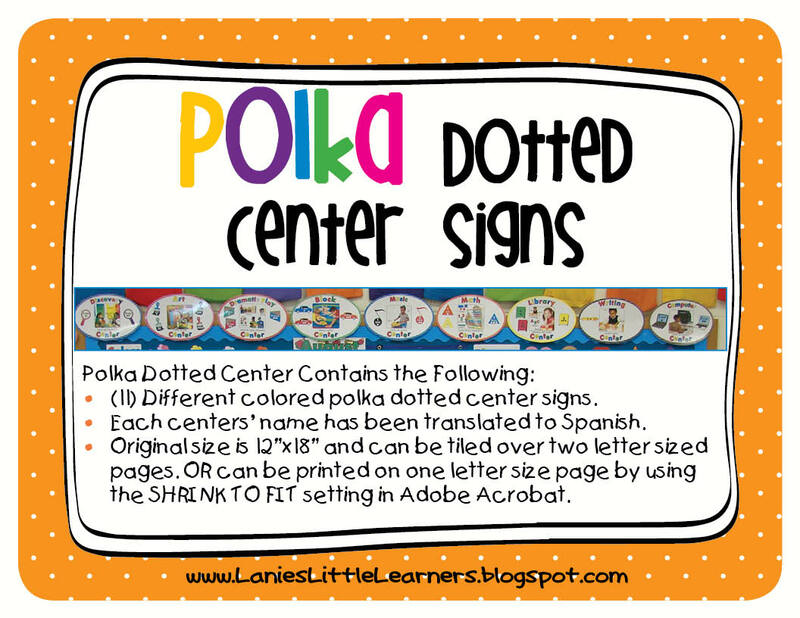 The images used to create the Polka Dotted Center Signs come from a wide variety of resources to include: Google Images, Scholastic, Borderbund, Art Explosion, and Microsoft Office Clip Art. Translation from English to Spanish was provided by Google Translate. (11) Different colored polka dotted center signs. Original size is 12” x 18” and can be tiled over (2) 8.5”x 11” sheets of card stock. OR the center signs can be printed using the FIT To PAPER selection. It is not for commercial use. It is for personal or classroom use only. The digital version in the form of PDF’s are not altered or transformed in anyway. 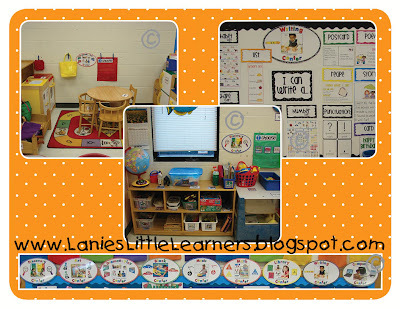 If you share an idea or printable that is from www.LaniesLittleLearners.blogspot.com please use them in a professional manner, give credit, and do not claim them as your own. If you find a downloadable file on www.LaniesLittleLearners.blogspot.com, you may not directly link it from your site. You MUST direct traffic to the blog post where it’s contained. Distribution is clearly prohibited. If others would like a copy of the material please direct them to www.teacherspayteachers.com/Store/Lanies-Little-Learners or www.LaniesLittleLearners.blogspot.com. The photos and clip art come from several sources to include, Art Explosion, Borderbund, MyCuteGraphics.com, KevenandAmanda.com, and Microsoft Office clip art. Under the copyright laws Circular 21, the images maybe used for educational purposes. The entire copyright circular can be downloaded from: www.copyright.gov/circs/circ21.pdf. The images are also covered under the Creative Commons Attribution 3.0 Unported. The license terms of the work can be found here http://creativecommons.org/licenses/by/3.0. Any questions, suggestions or comments, please email me at lanieslittlelearners@gmail.com.